Happy Valentine's Day! Okay, okay, we get it—Valentine's Day is nothing but a commercial construct annually forced upon us by our capitalist society (eye roll). We know. But, in my book, that isn't a good enough reason not to gorge yourself with the V-day-inspired treats I've posted below. Who the heck says you need a hot date to help you polish off six heart-shaped pie pops (thanks, Pinterest)? And as if I need to remind you that downing fruity, pink mimosas is by no means an act reserved solely for special occasions. Forget your romance woes. Instead, follow my lead and treat yourself and a friend to a light brunch, bumpin' tunes, and bottomless drinks. Scroll down for recipes and to see how our morning panned out! 1. Preheat oven to 350F. Sprinkle flour and roll the dough until it's about 1/4" thick. Use cookie cutter to cut out hearts. Recombine scraps and repeat. 2. Spoon jam into the center of half of the hearts, leaving space around the edges. If you'd like to make these pies into pops, press oven-proof sticks into dough at the tip of the heart. 3. Paint the egg wash along the borders of the pie crusts and connect heart tops using a fork, creating a seal. Finally, paint the tops of the hearts with the egg wash, sprinkle with sugar, and bake for 20-30 minutes until golden brown. Serve and enjoy! 1. Toast bread slices. In the meantime, stir together ricotta and lemon zest. 2. 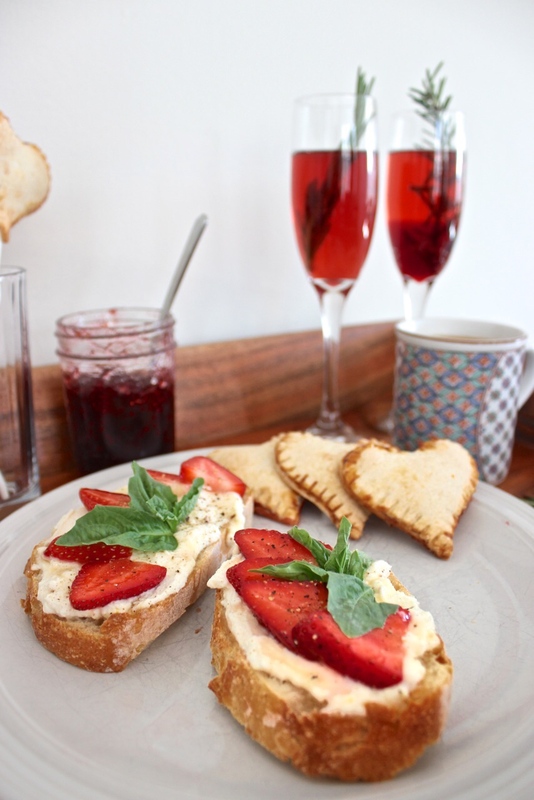 Spread each slice of toasted bread with ricotta mixture. Layer strawberry slices over top of the ricotta, followed by basil leaves. Season with salt and pepper, then drizzle with honey. Serve and enjoy! 1. Add 1 tablespoon of pomegranate seeds, a rosemary sprig, and 1½ oz of pomegranate juice to each glass. 2. Top with chilled champagne. Serve and enjoy!